*EDIT* seems to be popping in and out of stock for delivery. The £19.99 price is good for reserve & collect if your local store has stock. This is better and usually more expensive than the HS100 because this one has energy monitoring - logs and reports back its usage. Free delivery from Currys and don't forget Quidco - this says it is 'black tag' and there's mention of a special black tag cashback. Found the energy monitoring on mine were garbage. Returned them all for the 100s and was happy. Also got 6 more in that deal yesterday which was a bonus! If the deal is still on at Argos I would grab 3 X HS100's for £39.98 instead. That is if you don't need energy monitoring. Am i right in thinking these things can remotely control the items plugged into them jn terms if switching things off? Eg could i switch off the power to xbox or tv while i am at work? Found the energy monitoring on mine were garbage. Returned them all for …Found the energy monitoring on mine were garbage. Returned them all for the 100s and was happy. Also got 6 more in that deal yesterday which was a bonus! If the deal is still on at Argos I would grab 3 X HS100's for £39.98 …If the deal is still on at Argos I would grab 3 X HS100's for £39.98 instead. That is if you do need energy monitoring. Am i right in thinking these things can remotely control the items plugged …Am i right in thinking these things can remotely control the items plugged into them jn terms if switching things off?Eg could i switch off the power to xbox or tv while i am at work? I'm not too fussed about precise energy reporting figures, I want to …I'm not too fussed about precise energy reporting figures, I want to script up when energy drops to 0 which signifies something has finished such as the kettle and washing machine. ‌ oooohhhhh.... I like it. This device will use much more energy than the idle kettle. Maybe plug in into another one to check? The idle kettle uses 0, so yes. It's not doing much when switched off though, assuming its software is efficient, because it doesn't have to report anything back continuously. Could plug one into another I guess? :-) I wonder if they're accurate at such low levels though. I bought the WeMo versions for £35 from groupon as on research they are the only ones I could find that can output to a .CSV file for some work I’m doing. Accept that’s a niche but having just bought the echo plus I’m tempted to get few more for coffee maker etc! The idle kettle uses 0, so yes.It's not doing much when switched off …The idle kettle uses 0, so yes.It's not doing much when switched off though, assuming its software is efficient, because it doesn't have to report anything back continuously.Could plug one into another I guess? :-) I wonder if they're accurate at such low levels though. I don't own any hs110 so can't even try that, and I'm not sure either about accuracy with low load, but if someone has a more precise power meter I would really like to see the numbers. bit pissed off that I bought 2 of these at 30 at the begining of nov, 3 more at 25 on amazon a few days ago, and now they're 20. Your standard Google home or Amazon Alexa uses about 2-3 watts on standy or with soft/medium music. Loud music ramps it up to 7/8 watts. These plugs generally use between 0.5-1.5w on standby depending on model. Yes, globally it will all add up, but equivalently the amount of wattage saved in unneccesary standby time/lights on all night when they could rather be motion sensored/scheduled etc. would more than cancel it out. Remember the good 'ol 60w lighbulb that was left on all night? Swopping that single bulb with a new LED 10w bulb will allow you to run 20 smart devices with less power. deal expired - congrats to those who got it! bit pissed off that I bought 2 of these at 30 at the begining of nov, 3 …bit pissed off that I bought 2 of these at 30 at the begining of nov, 3 more at 25 on amazon a few days ago, and now they're 20. They're the same price at amazon now, email them and ask for a price match credit. They usually are willing if you don't abuse it all the time. I bought the WeMo versions for £35 from groupon as on research they are …I bought the WeMo versions for £35 from groupon as on research they are the only ones I could find that can output to a .CSV file for some work I’m doing. Accept that’s a niche but having just bought the echo plus I’m tempted to get few more for coffee maker etc! 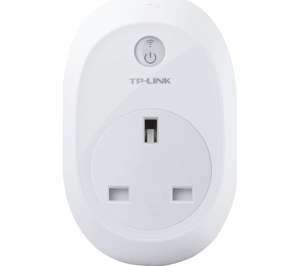 There are plenty of good APIs for the TP-Link so you could output to .csv if you want to script it. Google 'hs100 api' - the base HS100 API supports energy monitoring too (HS110) and the light bulbs. Also HASS.io works out of the box. I was watching the WeMo Insight price until I saw IFTTT support was added for the TP-Links. They're the same price at amazon now, email them and ask for a price match …They're the same price at amazon now, email them and ask for a price match credit. They usually are willing if you don't abuse it all the time. limited quantity of 1 only. I bought 3 of these plugs and the amazon CS isn't helping - saying "prices fluctuate all the time and we have a policy of blah blah not helping you at all blah blah"
Guess I'll buy 1 and return the most expensive one I paid 30 for just last week. Home delivery only for 19.99in store 24.99OOS for deliverydeal expired - …Home delivery only for 19.99in store 24.99OOS for deliverydeal expired - congrats to those who got it! Reserve for store collection is still £19.99, if your local store has any stock left! Reserve for store collection is still £19.99, if your local store has any …Reserve for store collection is still £19.99, if your local store has any stock left!Thanks - updating description. Even if you say it ran at 3W average (which I would guess would be way over what it actually uses, probably not even 2W) leaving it on constantly would cost around £3 for the year. If you're splurging out on smart plugs I'm guessing you probably wouldn't miss £3 a year. I'm pretty sure I tested my HS110 with my energy meter plug and it didn't even register 1W in idle. Hrm you've put me off, what was wrong with it? The Argos deal is still on. Some stores are now showing stock available for order, for delivery on Wed 29th November, which is ahead of the 1st December offer expiration date. I've just ordered three from there and paid for fastrack collection on Wednesday. Most stores in my area (central Scotland) are showing stock in four days now. There are plenty of good APIs for the TP-Link so you could output to .csv …There are plenty of good APIs for the TP-Link so you could output to .csv if you want to script it. Google 'hs100 api' - the base HS100 API supports energy monitoring too (HS110) and the light bulbs.Also HASS.io works out of the box.I was watching the WeMo Insight price until I saw IFTTT support was added for the TP-Links. Interesting. I’ve got enough on my plate that I wanted an out the box solution but good to know. Bought 3 for 2 yesterday at Argos. But regretting it, as realised that I have fallen for the hype of creating a 'smart home', and actually these are pretty pointless. For example, I set the first one up on a living room lamp. Only to the realise that actually, instead of now having to grab my phone , unlock it, launch the app, choose the lamp, then click on, that actually it was far easier, quicker and not to mention cheaper, just to switch the lamp on in the normal way. Look at how/when you use things and see how it can be improved. I have a lamp on the other side of the room to the door. I've can turn it on from Google Home, or I've stuck an Amazon Dash button to the wall by the door. Kasa and IFTTT will put widgets on your home screen so you don't have to launch the app. I use IFTTT and Stringify to automate sequences such as turning the heating on in that room, delaying 10 mins for me to load the dishwasher, then turning the light on. I've got HomeAssistant running on a raspberry pi to watch when my pc turns off. Then the heating goes off, lamp gets a 3 minute timer, and upstairs lamp goes on. I use the energy monitoring one for the kettle as I always forget about it. When it finishes boiling I get a notification then a 5 minute timer for brewing. Funny how they are back in stock now the price has gone up!